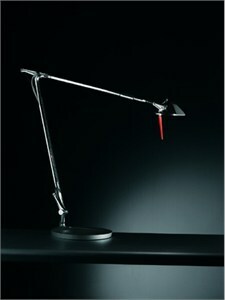 Medium broad beam light, ideal for local lighting, as a task or as a reading light. Base, clamp and desk connection in die-cast aluminium, arms in extruded aluminium.Die-cast aluminium diffusers. Base, clamp, wall and desk connection silver grey- arms silver grey, diffuser silver grey- polished arms, brushed diffuser.